Greene King Abbot Ale Bottle is a popular Ale available from Tesco Groceries in 50cl to buy online. Visit Tesco Groceries for the best price for 50cl of Greene King Abbot Ale Bottle or compare prices on our other Ale products. Brewed for quality of the highest order in the heart of Bury St Edmunds where brewing in the town's Great Abbey can be traced back to 1086. Brewed longer to a unique recipe creating a full flavoured, smooth and mature beer. This irresistible ale has masses of fruit characters, a malty richness and superb hop balance. Where to buy Greene King Abbot Ale Bottle ? Greene King Abbot Ale Bottle Supermarkets & Stockists. 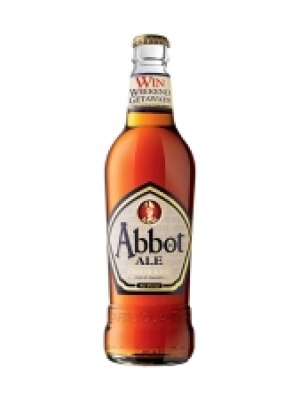 You can buy Greene King Abbot Ale Bottle online in most retailers and find it in the Ale aisle in supermarkets but we found the best deals online for Greene King Abbot Ale Bottle in Tesco Groceries, DrinkSupermarket.com, and others. Compare the current price of Greene King Abbot Ale Bottle in 50cl size in the table of offers below. Simply click on the button to order Greene King Abbot Ale Bottle online now.